Way to go, Yorkville Sound !!! Thank you for bringing back manufacturing of your YX Series of loudspeakers home to Canada from overseas! Even better that you are able to do this while being able to sell your products at the cost level of production done oversees. This will keep the Yorkville Sound factory in Canada active while workers maintain their steady jobs. KUDOS!!! The Yorkvile YX Series of loudspeakers is a cost effective product line with excellent sound and build quality at a great price point. All current "made in Canada" built products are shipping now. Yorkville has plans to bring back more YX series models in 2014 and the future. In my own opinion, Yorkville Sound tends to get look past by many professional sound engineers. Yorkville Sound makes some excellent products for the Canadian sound market for a reasonable cost. 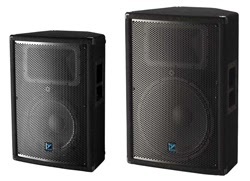 The YX Series of loudspeakers is an excellent choice for small, independant sound contractors and local bands alike at a reasonable cost. Plus, the Two Year "Even-If-You_Break_It" warranty is just amazing! If you buy Yorkville Sound, you will be covered if and when something goes wrong with your gear. Also, it is nice to know that if you require service on your gear, it only has to ship to the factory for repair here in Canada. I really enjoy using Yorkville Sound gear that is "Made In Canada"!